Comics evolved into small magazines from their roots as newspaper comic strips. Indeed, the first comic book ever published (Famous Funnies in 1933) was basically a reprint of humor strips. Which is why they are "comic" books or as my parents used to call them, "funny books". When Speedy shot heroin into his veins in Green Lantern I made a point to show them it wasn't funny any more. But I digress! Comics evolved from strips, which is why there was the grid on the page: 6 and 9 panel grids being the most commonly used in Golden/Silver/Bronze age books. I started wondering, how did splash pages evolve at Marvel? Who did the first splash page, Kirby or Ditko? I am factoring out the title page, which was usually a full page illustration, and also pin-up pages. I am more interested in when did Marvel's artists start deciding to use a full page illustration to knock out the reader with an impact in the middle of a story. 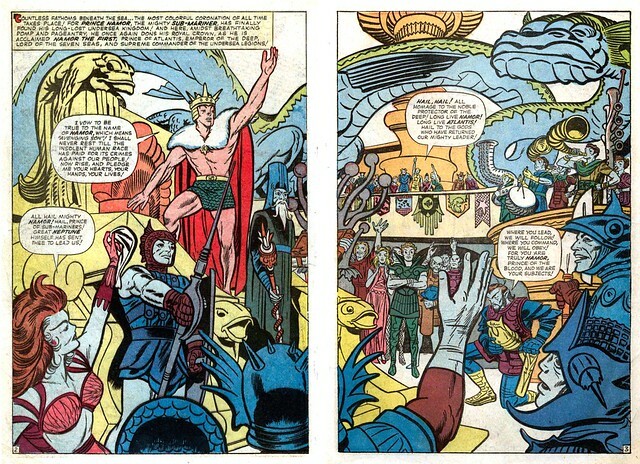 The earliest one that I could find was actually a double page splash, which Kirby used to great effect in Fantastic Four Annual #1 in 1963, to showcase the majesty of Prince Namor's kingdom. 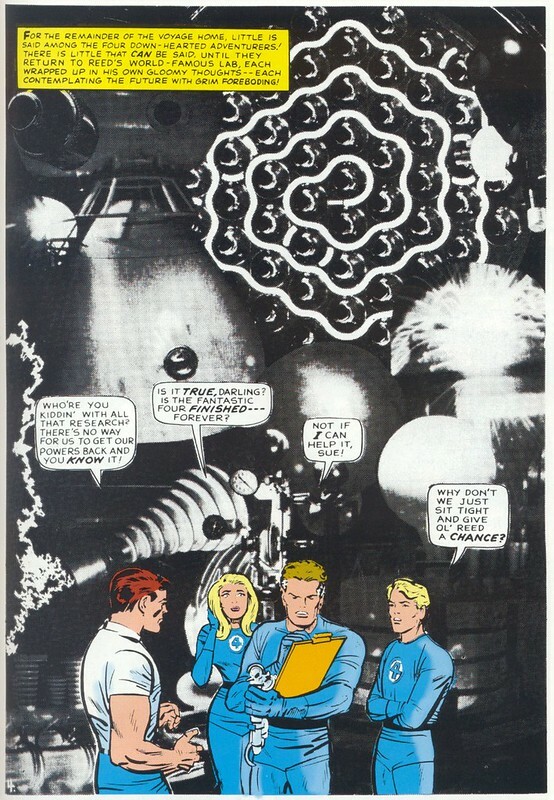 But in the regular FF comic, in 1964 you could see that Kirby was itching to bust out of the conventional grid system. 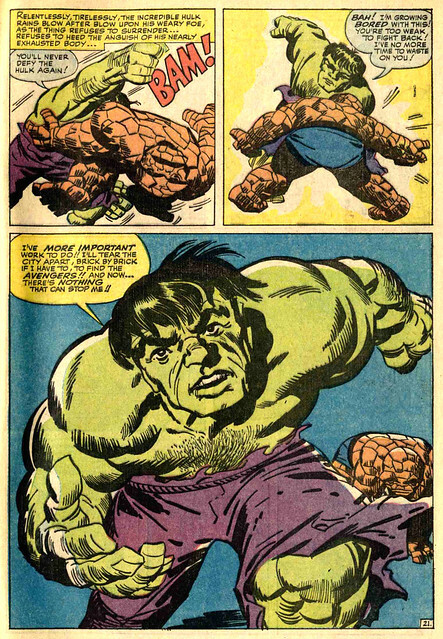 This page to FF #26 was a prime example, where the Hulk takes up half the page as he rages out of control and threatens to clobber not only the FF but the Avengers, too. Nowadays we almost expect to see at least 1 full page or double page splash in any given modern comic. 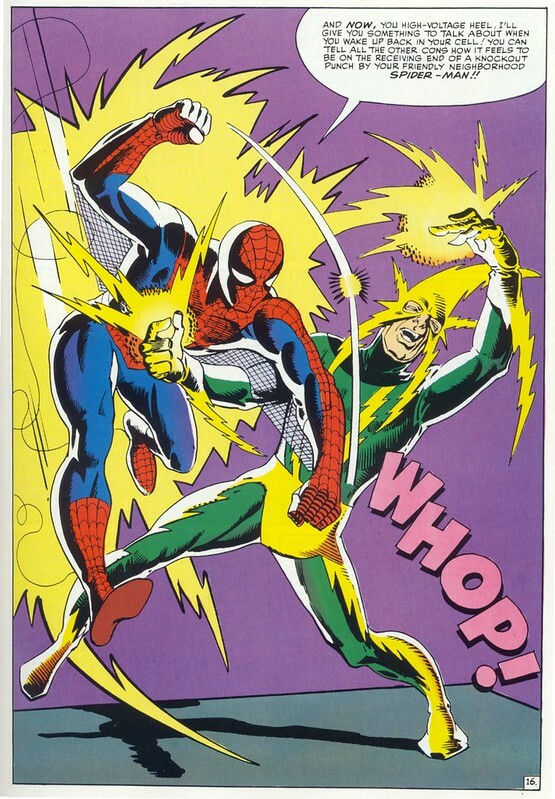 I remember reading Amazing Spider-Man Annual #1 in 1964, featuring Spidey versus the Sinister Six, and being knocked out by several excellent full page splashes, such as this one with Spidey and Electro. The annuals seemed like special events and the double length stories allowed the artists to break the rules. Or maybe they just had to fill more pages! But at the time, the full page splash was an awesome special effect for a kid. Steve Ditko pulled this off six times within the same annual, one page for each villain. My favorite Marvel annual ever. If you want to see this in prime glory, get the 1975 Marvel Special Edition which reprints this story in a treasury sized edition. 1964 seemed to be the turning point for splash pages. 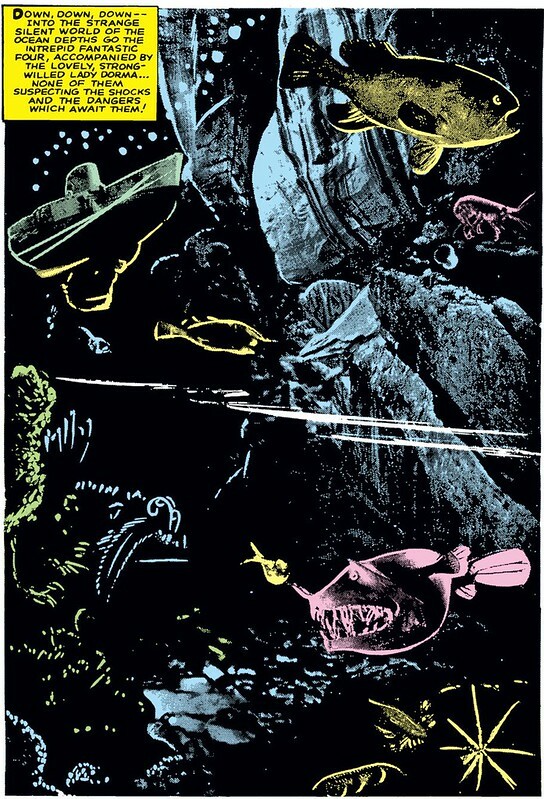 In Fantastic Four #33, Kirby presented the readers with this mind blowing page featuring the wonders of the ocean, as the FF travel towards Atlantis. The first Kirby collage? He did several more of these in the FF and continued to do them in other series. Amazing Spider-Man #33 (Feb 1966 but published in 1965), one of the greatest Marvel comics of all time, featured this dynamic splash page from "The Final Chapter". Even more ingenious is how Ditko played with the grid length on the preceding pages, using a 7 panel grid on one page, a 6 panel grid on the next page, a 4 panel grid, then exploding into the greatness of the splash page above. Ditko will forever be remembered as one of the masters of comic art just based on this single issue alone. When did Kirby draw his first in-story splash page in the Fantastic Four? 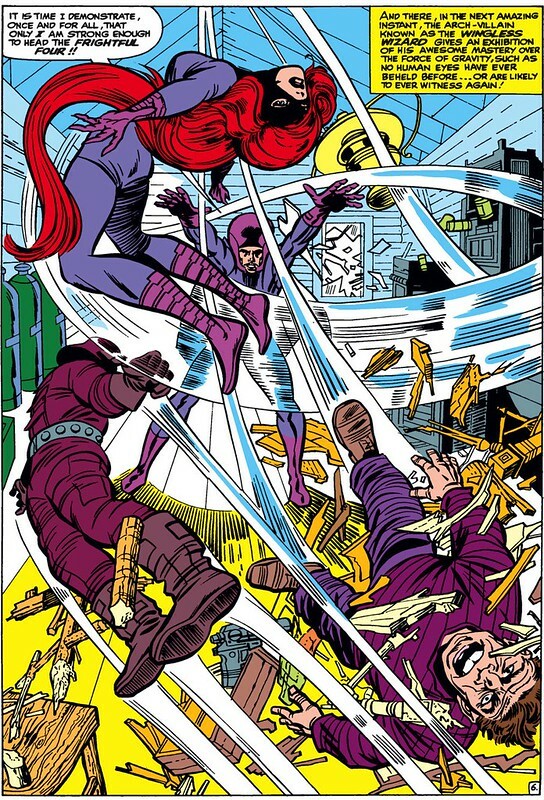 From my findings, it appears to be this one, from FF #38 in 1965 ("Defeated by the Frightful Four"). The Wizard just got thumped by the Trickster (Paste Pot Pete) and needs to show the gang who is really in charge. He thrashes Trickster, Sandman, and Medusa with his anti-gravity power--along with the contents of the room! A very nice effect. This issue, for my money, kicks Kirby into a higher gear with his storytelling that lasts for years. He opens up his panels to showcase even wider vistas of action. The following issue, FF #39, featured the team set against a cosmic collage as they try to figure out how to restore their powers. Kirby had figured out how to place the drawings of his own characters against the collage. It must have been a bit tricky back then; I wonder if modern artists truly appreciate their software tools which make layering images a snap! The debut story of S.H.I.E.L.D. in Strange Tales 135 had a scene that was perfect for a full page splash by Kirby. It's a classic scene where Nick Fury has been summoned to SHIELD headquarters and he discovers a bomb. Fury throws the bomb out the window, thinking he's in a building on the ground. 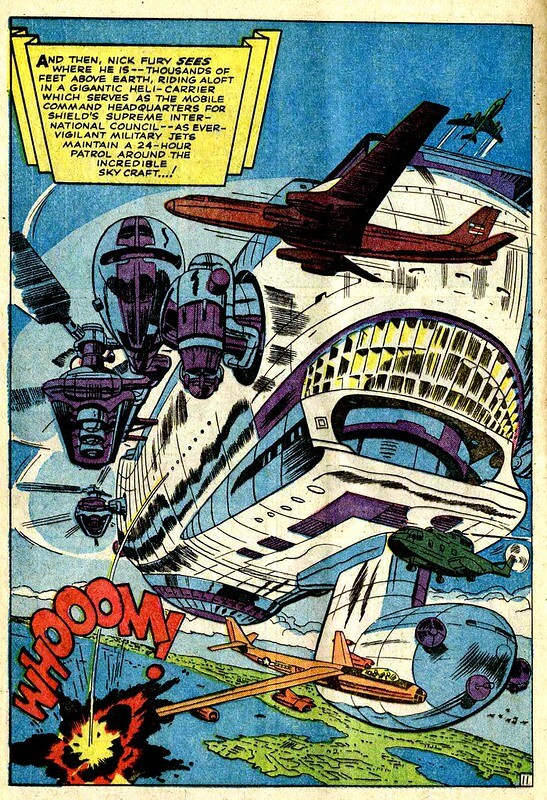 To the readers surprise, when they flip the page, they see the HQ is a flying helicarrier! 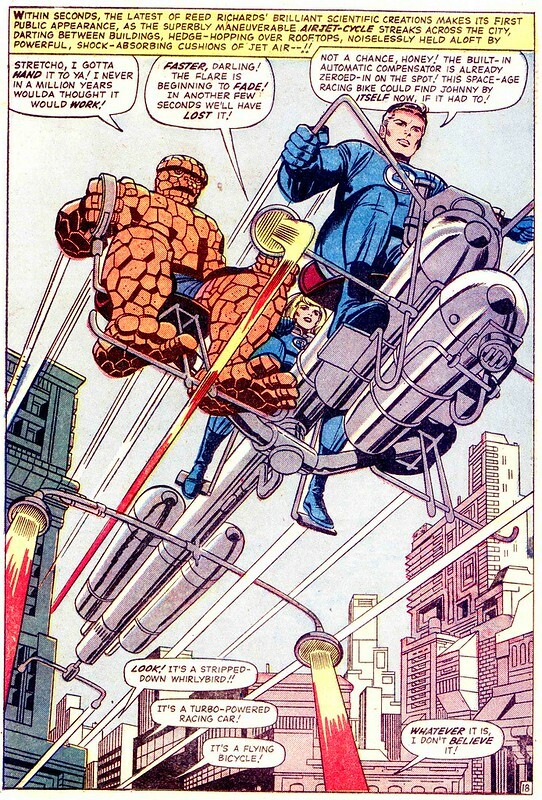 One of the most dynamic Fantastic Four splash pages occurred in FF #45, featuring the Airjet-Cycle carrying Reed, Sue, and the ever-loving Thing racing off to help Johnny Storm, who just discovered the Inhumans. The angle on this page composition is genius. You are viewing the cycle from a downward angle, just like a person walking on the street below. Stan Lee's dialogue here is really funny, too! Steve Ditko never did another in-story splash page for Spider-Man after ASM #33. He left that series, but continued to draw Doctor Strange in Strange Tales. ST #138 (1965) features the first even meeting of Doc and the abstract entity known as Eternity. 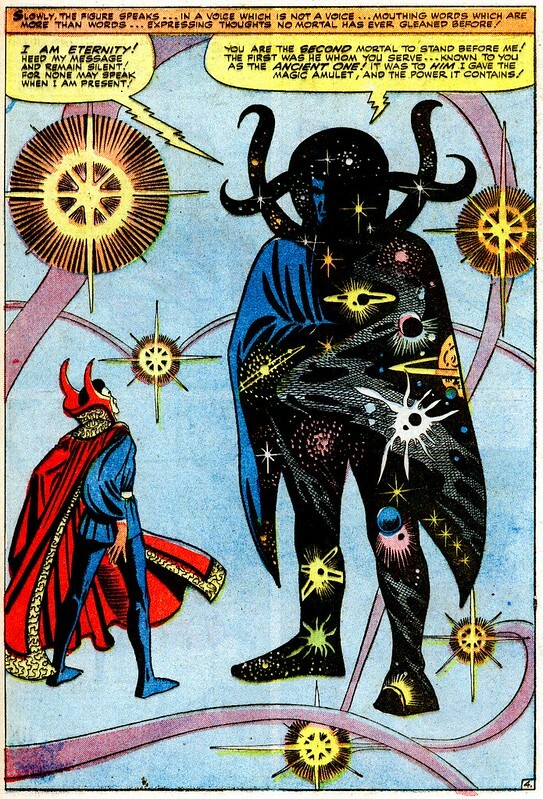 To make this a monumental event, Ditko used a splash page to depict the vastness of Eternity. Over in the FF, Kirby had a similar being to depict. 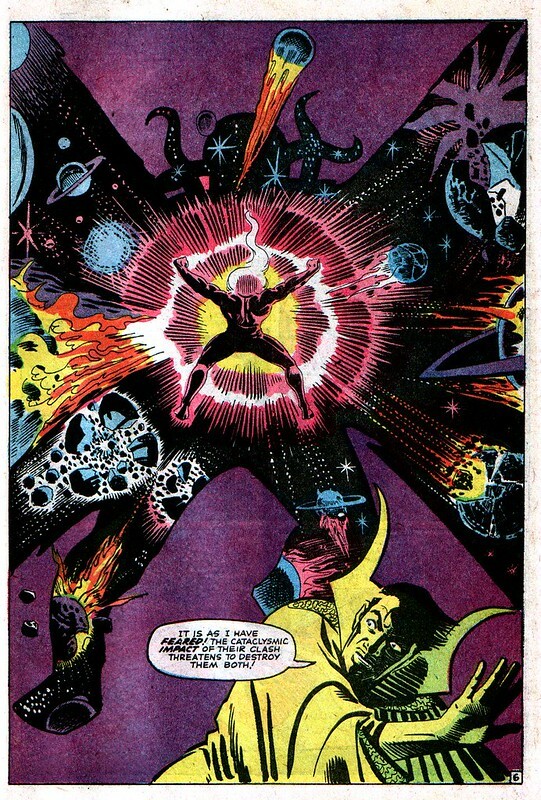 Fantastic Four #49 (1966) was the middle part of the Galactus trilogy and featured that awesome being in splash page, confronted by the Watcher. My first exposure to this page was in Marvel Treasury Edition #2, which made it look even more grand. Surely one of the most famous pages ever from the history of Marvel. Strange Tales #146 (1966) was the conclusion of epic storyline pitting Doc against Dormammu. This time Dormammu meets Eternity along Doc and decides to attack Eternity in his thirst for power and control. Ditko again uses a splash page to great effect. 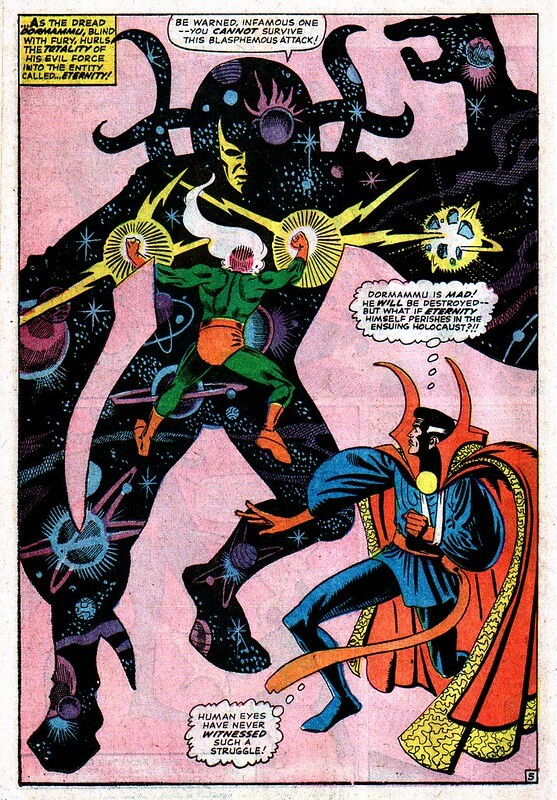 This issue is Ditko's finale from Doctor Strange and he made this last story so epic that there were two splash pages. The incredible cosmic battle between Dormammu and Eternity threatens to tear apart the entire universe! Ditko made a grand exit with this story which did not disappoint fans who had been reading Doctor Strange over the past two years. Although it left us wondering what might have been if Ditko had stayed on. In reviewing these old comics, I wonder how much Kirby and Ditko knew what the other guy was doing in their books? I had the impression that Kirby was working so hard he didn't have much time to read other comics. Perhaps he flipped thru each month's Marvel comics and saw what Ditko was doing, and vice versa? Did they feed off each others ideas and energy? Did Kirby see Dikto's splash page in the Final Chapter and say, hey, I can do something like that? This brings us to the year 1966 in Marvel's history. Ditko left Marvel, but Kirby stayed and continued to knock out fans with his artwork in the FF and Thor. I primarily covered the FF, Spider-Man, and Doctor Strange here to uncover the history of splash pages. But were there more? I did not check Thor or Sgt. Fury. I have no idea when DC Comics started using splash pages in-story. I can't recall seeing any DC book with a splash page until Neal Adams came along. What did I miss? Please let me know! Nuff Said! Great post. I've been a huge of Kirby's splashes, but I was surprised by the power of Ditko's splash work. He definitely held his own. Would love to see a follow-up post about how the splash page continued to evolve in the Bronze Age! I just discovered your blog. This post on Kirby and Ditko splash panels is one of my favorites. That first splash from Strange Tales #146 is the one that the production department used to paste together the cover of Dr. Strange 180. I have to quibble, though, with your recommendation of the Marvel Special Edition reprint of Amazing Spider-Man Annual #1. This is an abridged reprint which shortens the story by three pages. 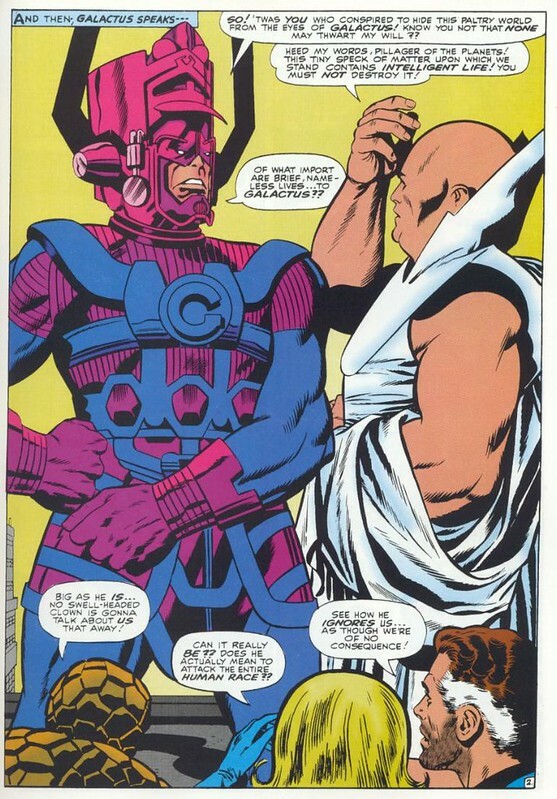 Worst of all, if memory serves me correctly, they actually omit one of the six splash panels – the Vulture, I believe.